Flavours Catering has in-house event managers who are here to take the stress out of catering your next corporate event for you. If you place your order by 3pm each day, we can deliver corporate drop off sandwich catering to your nominated address in Sydney the following business day at the time and place of your choosing. Just a single email or phone call and all of your catering needs will be taken care of by experienced and friendly staff. Flavours Catering can provide an assortment of corporate catering options that are available for next day delivery. Our gourmet freshly made sandwiches are seriously tasty and will ensure that your guests do not go hungry at your next corporate event. Our experienced and friendly event managers will be able to recommend a menu selection which caters for dietary requirements as well as your particular budget. Providing a selection of gourmet sandwiches for your next catered event is always well received. 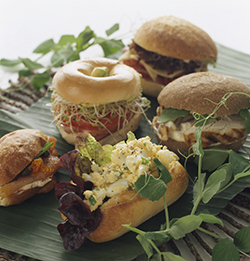 As standard, Flavours corporate sandwich catering includes six gourmet sandwich fillings. In every sandwich order we include a variety of meat and vegetarian fillings. If you have dietary requirements to accommodate do not fret! Our event managers can customise a menu to suit your particular group and budget. We can create tailored packages that accommodate specific dietary requirements and are friendly on your wallet too! Are you on the hunt for sandwich catering in Sydney? Look no further than Flavours Catering & Events. Our selection of fresh, healthy and delicious ingredients for sandwich fillings are teamed with a gourmet selection of different bread types. We know you won’t be disappointed. For your next all day corporate event why not order one of our all day catering packages. Morning and afternoon tea items will be delivered in combination with corporate drop off lunch sandwich platters and salads, along with beverages if required. Flavours Catering can provide drop off or staffed sandwich catering options for your next corporate event. Our event planners will work with you to determine exactly what’s appropriate for your particular group and provide menu options to match.